This blog post explains, in step by step, how to configure WSO2 ESB and WSO2 Identity Server to work with multiple user stores to do run-time authentication and authorization checks with multiple user stores. First download the deployment.zip from here and unzip it to the local file system. All the files referred in this blog post are inside this zip file. - Copy repositoy.conf/ad.prop to [ESB_HOME]/repository/conf - You can add any number of AD connections there - please update the file with your settings and following semantics. - Add the following to the [ESB_HOME]/repository/conf/carbon.xml - just under root. - Replace the Synapse configuration [Main --> Service Bus --> Source View] with the content from synapse/synapse.xml. This will create proxy called "test" with Entitlement Mediator - connecting to the Echo service. - Secure the "test" proxy with UsernameToken, following the wizard. Select 'Everyone' for the role. - Copy repositoy.conf/ad.prop to [IS_HOME]/repository/conf - You can add any number of AD connections there - please update the file with your settings and following semantics. - Copy repositoy.conf/entitlement-config.xml to [IS_HOME]/repository/conf 2.4 Start IS 2.5 Go to Main --> Entitlement --> Administration --> Import New Entitlement Policy and import xacml/policy.xml from the file system and Enable the policy. Change the policy appropriately. All set now, use TryIt from ESB against the "test" proxy. 1. Echo service is Unsecured. 2. Any attriute Id referred from XACML policy must be declared in ad.prop in IS. This blog post explains how to run two OpenLDAP instances in the same machine under MAC OS X. 1. Setup the first instance of OpenLDAP as explained in my previous blog post. 2. Execute the following commands in the same order. 6. Start the first OpenLDAP server running on the default port. 6. Start the second OpenLDAP from the following command. This blog post explains how to setup OpenLDAP under Mac OS X and I have tried this out successfully under OS X Lion. First we need to install the correct Xcode version corresponding to the OS X and then the latest MacPorts. Once this is done installing OpenLDAP via MacPorts is quite simple. The above will install OpenLDAP with Berkly DB back-end. We need to worry about two configuration files here - slapd.conf and ldap.conf. You will find these two config files as slapd.conf.default and ldap.conf.default, in that case rename those to be slapd.conf and ldap.conf. Also make sure you copy the /private/var/db/openldap/openldap-data/DB_CONFIG.example to /private/var/db/openldap/openldap-data/DB_CONFIG. First let's open up ldap.conf. There you need set the BASE for LDAP tree - and also the URI for the LDAP server. That's all - change those settings and save the file. Next we need to modify the slapd.con file. This is one of the main LDAP configuration files. Please make sure all related schema includes are there.. un-commented..
Then you need to set suffix, rootdn and rootpw. suffix needs to be the same as what you defined for BASE in ldap.conf. rootdn is the DN of the OpenLDAP root user. Here I have it as cn=admin,dc=wso2,dc=com. This is bit tricky and most people get this wrong. If you just put any clear text value to rootpw - then when you try do an ldapsearch and try to authenticate, it will fail with the following error. The reason is, the default distribution which comes with MacPorts, is built with clear text passwords being disabled. So you need to generate the password in SHA first and then put it in to the slapd.conf. To generate the SHA password you can use the following command. Following is the complete slapd.conf file. # rootdn can always read and write EVERYTHING! # be avoid. See slappasswd(8) and slapd.conf(5) for details. Save the following in to a file called root-ou.ldif. "cn=admin,dc=wso2,dc=com" is the value of rootdn that we setup in slapd.conf. When prompted for password, you can give the rootpw. Now, let's add a OU called people under this. Once again, save the following to a file called people-ou.ldiff. If your OpenLDAP instance is running on a different port than the default one - we need to use the following command instead of the above. 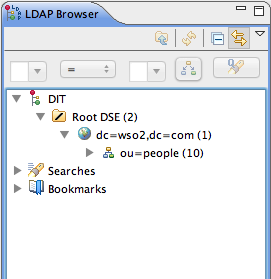 This will create a OU structure as shown in the image below.. Basically you can connect Apache Directory Studio to your running OpenLDAP instance to view it. OpenLDAP comes with set of default schema files, which you can find inside /private/etc/openldap/schema. If you want to have your own schema loaded in to OpenLDAP, what you have to do is, write your schema file and copy it to /private/etc/openldap/schema and edit the slapd.conf to add an include pointing to your schema file. Then you need to restart the OpenLDAP server. /private/var/db/openldap/run/slapd.pid is the place where the process id of the OpenLDAP process being stored - and this location can be configured in slapd.conf.